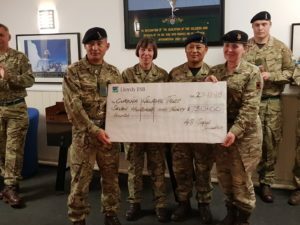 WO1 (SVWO) Gurung from 48 Signal Squadron in Birmingham organised a variety of events throughout 2018 to raise funds for the Gurkha Welfare Trust. Events have included Gurkha curry nights, Gurkha games nights and raffles. The final total raised from these events was £730 which will make a difference to Gurkha veterans, their families and communities. WO1 (SVWO) Gurung commented: “I believe they were very successful events, highlighted by the brilliant donation made to the trust. I hope everyone who attended these events enjoyed themselves and I would like to thank all who donated on behalf of the trust”. He added: “I know this is not a big amount, however this will definitely benefit across Nepal, to our Gurkha veterans, their families and communities. The trust has been able to offer a lifeline to so many people over the last 48 years. “My sincerest thanks to Officer Commanding, 48 signal Squadron, all members of the unit and the Royal Signal Association members for their generous support and for being part of this”.